Whatever your physical condition, alignment-based Iyengar yoga can help you build strength and flexibility. First group class is always free. Come for a free sample group class! 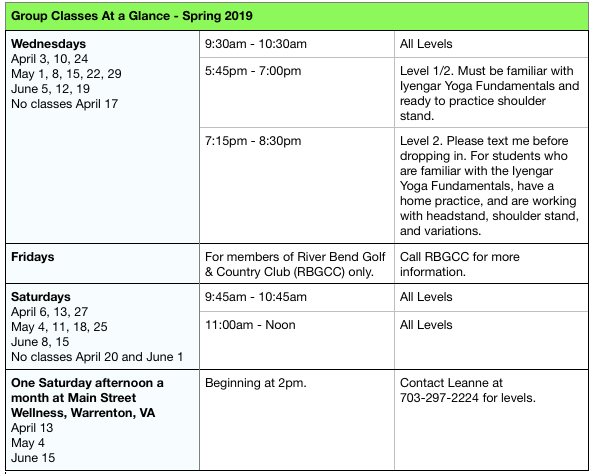 View our current Group Class Schedule at a glance. Iyengar yoga is unique in that we look at your body to determine what type of practice is right for you and adapt poses so you can access the power of practice, whatever your level. Are you new to yoga and want to build your practice on a sound foundation? Do you have physical matters — shoulders, knees, back, or something else — and want to know how to practice yoga while caring for your body? Are you an experienced yoga practitioner looking to take your practice or teaching to the next level with Iyengar yoga? Are you a healthcare practitioner who wants to refer your patients to a yoga practice that builds strength and flexibility with a focus on alignment for safety? As a certified Iyengar yoga teacher, I focus on making poses accessible to all body types and adapting poses based on student needs while creating a warm, positive space for practice. I teach yoga to focus on proper alignment and technique for systematic intelligence to benefit people with a range of conditions. Together we can build your strength, flexibility, and equanimity, and improve your overall health. My Reston yoga studio is right off the Fairfax County Parkway (near the intersection of Elden Street). This is the only Iyengar yoga studio in the Reston-Herndon, Virginia area. Click here to learn more about what to expect when you come to practice at Yoga 4 All Bodies. Questions? Text or call Leanne at 703-297-2224. Healthcare Practitioners—are you looking for a strength building yoga practice for your patients? Click here. Students—are you looking for a yoga class adapted to your physical needs? Click here. Copyright © 2019 Yoga 4 All Bodies. Powered by WordPress. Theme: Spacious by ThemeGrill.